The Scottish Rate of Income Tax came into effect on 6 April 2016. HM Revenue and Customs (HMRC) collect the Scottish rate of Income Tax on behalf of the Scottish Government. Who pays the Scottish Rate? HM Revenue and Customs (HMRC) are responsible for identifying who is a Scottish taxpayer and in doing so issue new tax codes which begin with the letter 'S'. Employers and pension providers don’t need to decide this and should only use a Scottish tax code if HMRC tell them to. Employees will be classed as a Scottish taxpayer if the address HMRC holds for them is in Scotland. It is the employee's responsibility (not the employer) to notify HMRC if their address has changed, or which home counts as their main home if they have one in Scotland and one somewhere else in the UK. If an employee disagrees with their tax code, they are advised to read the guidance on the Scottish rate of Income Tax before contacting HMRC. Employers don't need to change how they report or make payments for Income Tax to HMRC, other than to apply the Scottish rate of Income Tax code to their Scottish taxpayer employees. If you are given a P45 with a Scottish tax code, follow the normal procedure. Week 1/ Month 1 basis also applies to Scottish tax codes. 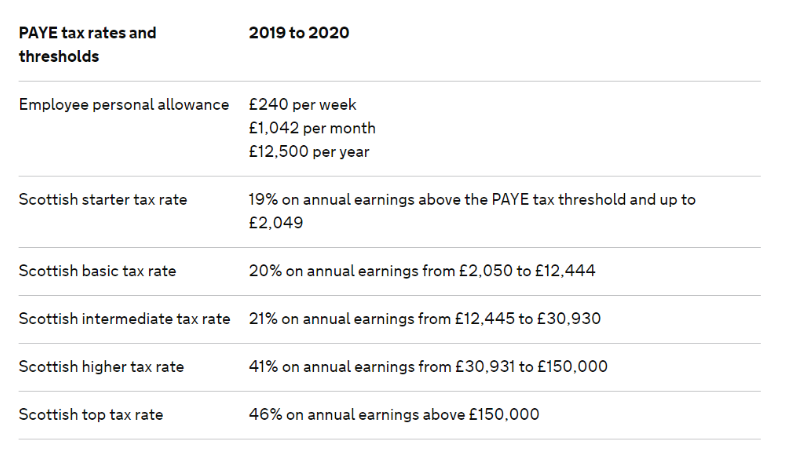 Employers don't need to show the Scottish rate separately on employees' P60s or payslips, but should show the Scottish tax code.